The UN Oceans Conference planned for June 2017 aims to create a more coordinated global approach to protecting the world's oceans from rising threats such as acidification, plastic litter, rising sea levels and declining fish stocks. UNITED NATIONS, Feb 20 2017 (IPS) - Children growing up in the Seychelles think of the ocean as their backyard, says Ronald Jean Jumeau, Seychelles’ ambassador for climate change. “Our ocean is the first and eternal playground of our children, they don’t go to parks they go to the ocean, they go to the beach, they go to the coral reefs, and all that is just collapsing around them,” Jumeau told IPS. “We are not emitting that much carbon dioxide but we are taking everyone else’s carbon dioxide into our oceans,” says Jumeau. "There’s 3 billion people around the world that are primarily dependent on marine resources for their survival and so they depend on what the ocean can produce,” -- Isabella Lövin, Sweden’s deputy prime minister. Despite decades of research, the blue carbon value of oceans and coastal regions is only beginning to be fully appreciated for its importance in the fight against climate change. “There’s proof that mangroves, seas salt marshes and sea grasses absorb more carbon (per acre) than forests, so if you’re saying then to people ‘don’t cut trees’ than we should also be saying ‘don’t cut the underwater forests’,” says Jumeau. This is just one of the reasons why the Seychelles has banned the clearing of mangroves. 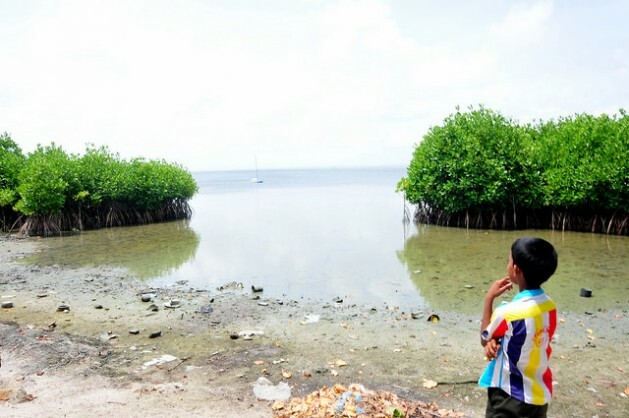 The temptation to fill in mangrove forests is high, especially for a nation with so little land, but Jumeau says there are many benefits to sustaining them. As well as absorbing carbon, mangroves guard against erosion and protect coral reefs. They also provide nurseries for fish. Its not just coastal forests that take carbon out of the atmosphere. Oceans themselves also absorb carbon, although according to NASA their role is more like inhaling and exhaling. The Seychelles, whose total ocean territory is 3000 times larger than its islands, is also thinking about how it can protect the ocean so it can continue to perform this vital function. The nation plans to designate specific navigation zones within its territories to allow other parts of the ocean a chance to recover from the strains associated with shipping. The navigation zones will “relieve the pressure on the ocean by strengthening the resilience of the oceans to absorb more carbon dioxide and ocean acidification,” says Jumeau. He acknowledges the plan will only work if all countries do the same but says you have to start somewhere. Fortunately other countries are also, finally, beginning to recognise the importance of protecting the world’s oceans. Isabella Lövin, Sweden’s deputy prime minister and climate minister told IPS that the world is going “in the totally wrong direction,” when it comes to achieving the goal of sustainable oceans and life below water. “All of this is putting a tremendous, tremendous pressure on our oceans,” said Lövin. Together with Fiji, Sweden is convening a major UN Ocean Conference in June this year. The conference aims to bring together not only governments but also the private sector and non-governmental organisations to create a more coordinated approach to sustaining oceans. It will look at the key role that oceans play in climate change but also other issues such as the alarming prospect that there will be more plastic in our seas than fish by the year 2050. “There’s 3 billion people around the world that are primarily dependent on marine resources for their survival and so they depend on what the ocean can produce, so it’s about food security, it’s also about livelihoods for hundreds of millions of people that depend on small scale fisheries mostly in developing countries,” said Lövin. Lövin also noted that rich countries need to work together with developing countries to address these issues, because the demand for fish in rich countries has put a strain on the global fish stocks that developing countries rely on. Isabella Lövin is an IDIOT.